A grumble about Winter Wonderland, again. Look at this scene. Look at it. Depressing right? A waste land. The sort of dismal, dystopian scene which could serve as the setting for a Cormac McCarthy film. Or a Ken Loach film. Or literally any kind of war film, tangled balls of barbed wire lying in the muddy pools of water. The odd bloody limb sticking out of a pothole. Steel helmets strewn about. It isn’t any of these things. It is Hyde Park. 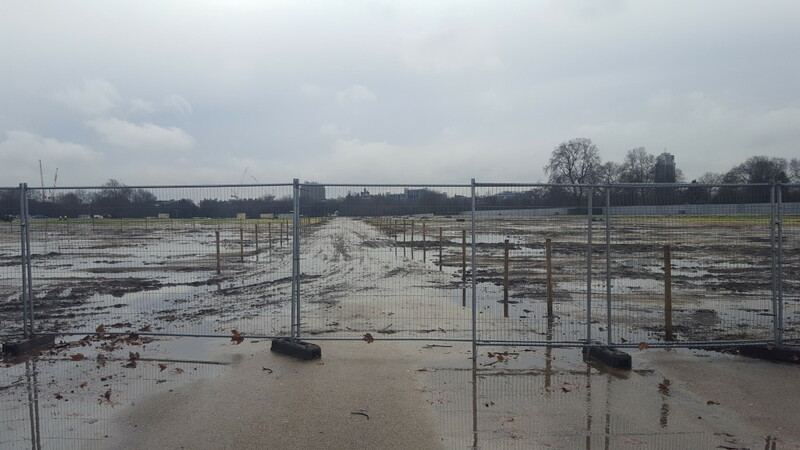 Hyde Park after Winter bloody Wonderland has rolled out again. LOOK at it again. I have seen cheerier pictures of Soviet Russia. I moaned about Winter Wonderland before Christmas in a different post (read it HERE if you like, scroll down a bit because I bang on about other things before I get to that point). But this is even worse than it’s been in previous years so I am especially livid. My only suggestion is that Westminster Council rings up Steven Spielberg or Quentin Tarantino and asks if they’re looking for a location. Because then they might be able to claw back the cash to make Hyde Park an actual park again, instead of an exclusion zone.